This coral reef system is Australia’s 2,300-kilometre-long underwater playground spanning two-thirds of the northeastern coastline, extending north from Bundaberg on Queensland’s coast to Cape York, the northern tip of Australia. Sail a boat, scuba-dive or snorkel for amazing underwater vistas, go bare boating, cruise shipping and expedition cruising…. Or, enjoy ‘above water’ activities without getting a hair wet…. Take a helicopter, fixed-wing aircraft or seaplane scenic flight over coral cays or view teeming underwater life from a glass-bottom boat. Go camping on one of the 600 islands or stay in a tropical island resort, hike a forest trail or simply sit back on a pristine beach and breathe in spectacular views and sea vistas. 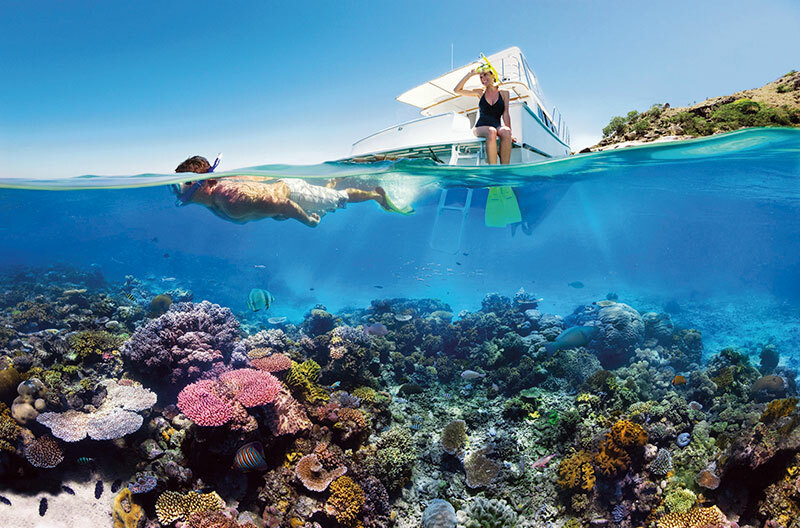 Take a step back and smile as the Great Barrier Reef takes your breath away. With stunning coral reefs, colourful marine life and a rainbow of blue water as far as the eye can see, it’s a once-in-a-lifetime experience not to be missed. The 411 species of hard coral and over 150 species of soft coral (10 per cent of the world’s soft coral) that make up the Great Barrier Reef, are home to more than 30 species of whales and dolphins, 1,625 species of fish, as many as 3,000 species of mollusks, six of the world’s seven species of marine turtles, over 120-year-old giant clams and millions of nesting seabirds. Turtles, crocodiles and sharks are the marine ‘dinosaurs’ of the reef. Turtles have been on the reef for 150 million years, crocodiles for 200 million years and sharks for around 400 million years! Spot whales, clownfish, rays, Maori wrasse and cod. Enjoy spectacular annual events including the northern whale migration, turtle nesting and coral spawning. From the ribbon reefs to the wrecks, discover some seriously stunning coral and meet the great eight when you scuba or snorkel on the Great Barrier Reef. 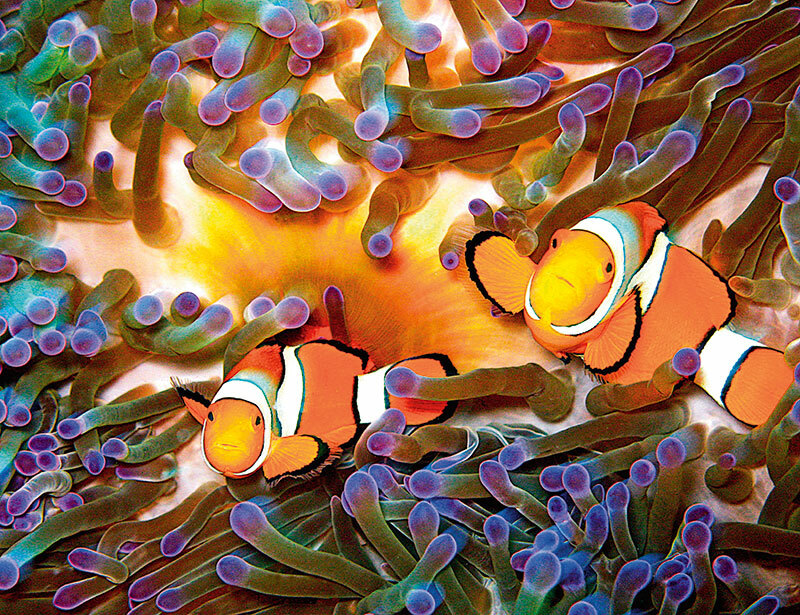 Whether you are a newbie or a scuba diver aficionado, get your fill with over 120 dive sites. Take a helicopter or seaplane to view stunning coral formations and the big blue from above. 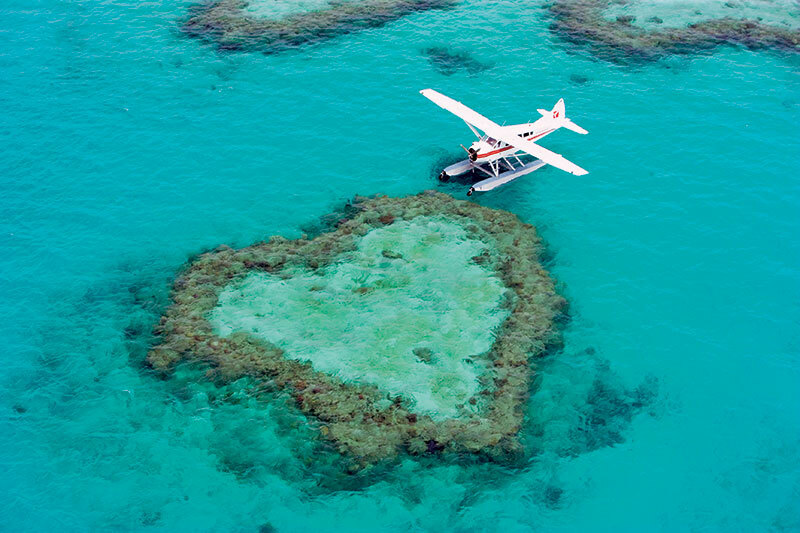 If you’re keen to see the ‘heart’ of the reef, head to the Whitsundays. Stay dry with a glass bottom boat to get a sneak-peek of the corals and what lies beneath. Choose one of the 2,900 islands to explore and relax in über-pimped-out style or take the un-crowded, secluded option by staying on one of the reef’s island resorts, go camping or even Reef Sleep. Drop anchor at one of the deserted tropical beaches and find the perfect spot for a picnic lunch. Skipper and bare boat around the reef and islands. Sip champagne on a luxury yacht. Grab your snorkel and fins and step off a reef island or jump off your boat to snorkel. Get a turtle selfie and meet manta rays and Nemos, as most marine animals hang out in the top four metres of the ocean.